100th round of golf for Barack Obama as President, subtitled … The POTUS Putters and the economy sputters and 15 million out of work Americans mutter. President Barack Obama has hit they century mark in rounds of gold played as President of the United States. UNREAL. As 15+ million Americans are out of work, 8.2% are unemployed, 13.6% Blacks unemployed, 11.0% Hispanics unemployed, discouraged workers rose as well, swelling to 14.8%, and the US debt continued to rise to a near $15.8 trillion … the out of touch President who thinks the private sector is doing fine plays yet another round of golf. But let’s cut BO some slack, after all fundraising and disregarding the US Constitution is a hard job. What disregard Obama has for Americans who struggle to put food on the table and keep a roof over their head. Since Obama is so good at playing the race card and pitting the wealthy vs. the middle class and the poor … just curious Black, Hispanic and Blue collar America, how many rounds of golf did you play in the last 4 years? Hmm? Obama has already played golf eight times this year. 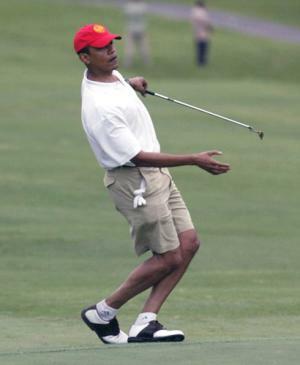 He actually is a little off his normal pace – perhaps campaigning is intruding on golf. The president golfed 28 times in 2009, 30 times in 2010, and an incredible 34 times in 2011. Obama’s golfing takes about five hours, including the motorcades back and forth from the fairways. If one thinks of this as taking up much of the day – include getting ready to go and cooling off afterward – its fair to say that Obama has spent more than three months of his presidency golfing. UPDATE I: Oh the hypocrisy of the LEFT … from 1994 comes a VIDEO of Obama’s top adviser David Axelrod calling Bush 41 out of touch for playing golf in a bad economy. Video from 1994 has surfaced of David Axelrod, President Obama’s chief campaign strategist, calling former President George H.W. Bush “out of touch” for “tastelessly” playing golf while trying to convince voters that the economy is improving. “Bush tastelessly did it, often from the ninth hole, and from the cigar boat and other places,” Axelrod said. Breaking News: Barack Obama Goes Golf AGAIN!!! have a child in charge of our future! I would like to know when the MSM is going to ask Axelrod if he thinks that Obama is out of touch as it relates to the comments he made about GWB golfing during a bad economy.